Are you aware of how Making Tax Digital (MTD) will impact your business? With filing restrictions coming into play 1st April 2019, many clients are still not aware of the full implications of MTD and how they will impact them and their business. It’s not simply just how you file your return that may be effected. It’s true, as part of the MTD changes HM Revenue & Customs VAT filing gateway will close and clients will now be required to file via third party software. What many people don’t know is that the way in which you record your records may be effected. As part of the new MTD requirements, data must now be entered in a reasonable manor. Depending on the number of transactions, this will dictate how often you should update your records. Ideally at the moment we are saying for example if you have 100 transactions daily, then daily entry is advised however if you have say 10 transactions, weekly should be sufficient. Until MTD goes live, we unfortunately won’t have any case law to use as a guideline therefore the above is based on our interpretation only. At the moment a statement has however been released that retail businesses should update on a daily basis, For now we will keep you updated on any further guidelines issued. One thing is for sure, monthly or quarterly record keeping will no longer comply, and regular bookkeeping will most definitely be required. So when will MTD VAT changes affect you? 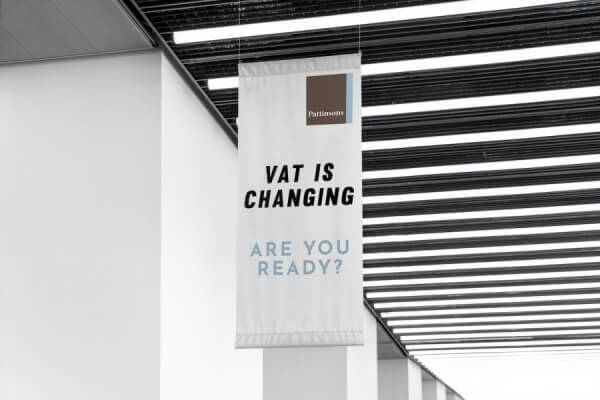 Although the changes commence 1stApril 2019, it will actually affect your first VAT period beginning on or after 1stApril 2019. So for example, if your VAT quarter ends are 30thApril 2019 and then 31stJuly 2019, it will be your 31stJuly 2019 period that will be the first required to comply. For those who are registered voluntary, MTD will not apply. If however you have a particularly good year and you reach or exceed the VAT threshold, you will then need to comply going forward. Once you are under MTD, you can’t leave. With these changes still being 6 months, Pattinsons will endeavour to keep you posted with any future updates. If you are worried, require assistance getting ready to comply or would like more information, please do not hesitate to contact us.